As July comes to a close along with many of our summer programs, we are excited to finally share our work with you. The truth is, our three summer programs have kept us so busy we have hardly had any time to post on our blog or social media platforms. Now as we prepare for some exciting new developments including a public exhibition at Mount Vernon Nazarene University’s Schnormeier Gallery (more details to come), we want to catch you up on our work since May. Stay tuned in the coming weeks for more posts about SOIL SERIES‘s 2018 summer programs. Sadly this year’s conference, which took place May 11 – 13 at the Queens Museum and a constellation of sites throughout New York City, was the last for Open Engagement in this form. They are currently conducting a “Survey for the Field + Call for Collaborators” to determine how to move forward. 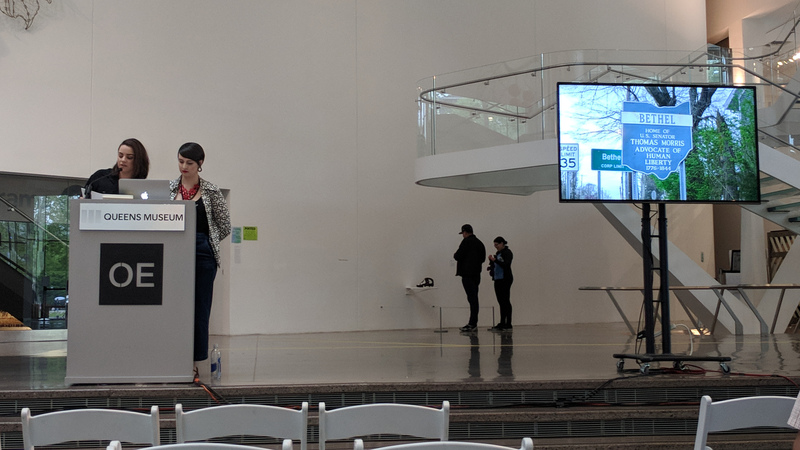 We felt honored and fortunate to participate in the tenth and last Open Engagement conference, and we were especially excited to be able to present at the Queens Museum, an institution we have long admired. When we learned we had been accepted into the conference and would be presenting as part of the Open Platform series, which would be open to all patrons of the Queens Museum and not just paying conference-goers, we decided to use the opportunity to present as true a portrait of Bethel as possible. Hillary’s time in New York during graduate school helped her understand just how wide the gap in understanding can be between the New York art world and rural communities like Bethel, and we jumped at the chance to offer the audience a different perspective. SOIL SERIES: A Social Drawing is an ongoing collaboration between artists Francesca Fiore and Hillary Wagner and the rural Appalachian community of Bethel, Ohio. Since the 2016 presidential election, Appalachia has come to the fore in American political discourse. Currently one year into their project, the artists will reflect on the new forms socially engaged praxis can and must take when carried out in the context of rural America. Preparing for the presentation was a long process. How could we best represent the complexities of Bethel and in doing so, Appalachia more broadly? In particular, we were interested in subverting media narratives such as the “Trump Country think piece,” and we turned to Elizabeth Catte’s What You Are Getting Wrong About Appalachia and Steven Stoll’s Ramp Hollow to help us better understand the larger context. In What You Are Getting Wrong About Appalachia, Elizabeth Catte points to the long history of “top-down” media narratives about Appalachia, which cast the region as a “monolithic ‘other America’,” (9) and often omit Appalachian voices altogether, or at least those that challenge popular stereotypes. She calls for Appalachians like herself to reclaim their narrative by creating new images that better reflect the true complexity and diversity of the region. She calls it “remaking” Appalachia in one’s own image, and as we sorted through the thousands of photographs we took during SOIL SERIES‘s first year in Bethel, we watched our own “remade” narrative emerge – one that puts Bethel’s people first and celebrates the place for its richness and nuance. Below is the video of our presentation on May 13th in the atrium of the Queens Museum. Read on below for more about our trip and our experience at Open Engagement. Speaking at Open Engagement was a great excuse to visit friends and family and view some amazing art exhibitions in New York and Philadelphia. When we first arrived in New York, I headed to New Jersey to see family while Hillary caught up with some friends and took in several remarkable exhibitions. At the The Met Breuer Hillary saw Leon Golub’s Raw Nerve and Like Life: Sculpture, Color, and the Body. Together we met up in the city to spend some much-needed time with friends from Parsons and catch up on their new work. Our visit also happened to coincide with a student worker strike and cafeteria occupation at The New School. We visited old haunts together and enjoyed what the city had to offer, but mostly (as usual) we worked. By far the favorite part of our trip, however, was finally getting the chance to visit Mary Mattingly’s Swale. “Swale is a floating food forest built atop a barge that travels to piers in New York City, offering educational programming and welcoming visitors to harvest herbs, fruits and vegetables for free. Swale strives to strengthen stewardship of public waterways and land, while working to shift policies that will increase the presence of edible perennial landscapes.” Mary Mattingly was influential to both mine and Hillary’s artistic development (see our post about the Community Studio “Ranch Icons” project inspired by her series House and Universe), and we have long admired Swale as an example of how food activism can be beautiful, artful, and innovative. The experience of visiting Swale is like no other. This summer Swale is docked at Brooklyn Army Terminal in Sunset Park, Brooklyn. Walking onto the barge feels like entering another universe – the contrast is stark against the industrial landscape. When we visited Swale it was early in the season and the plants on the barge were just starting to bloom. We spoke with Marisa Prefer, the Food & Gardens Manager at Swale, about permaculture (stay tuned for an upcoming post about a local permaculture gardener we interviewed for Community Studio), and we met some lovely women from the Southern Heritage Seed Collective. Hillary and I truly felt right at home on Swale, and when Marisa needed help fixing the barge’s ramp, we jumped right in to help. It was an indescribable feeling being able to reach down and pick fresh kale and garlic mustard right in the heart of Brooklyn. We watched as curious pedestrians wandered onto the barge with a look of surprise and confusion and were greeted by Marisa and Mary, urging them to walk through the gardens and forage for food. Thank you to everyone at Swale for the beautiful experience. Finally the moment arrived for us to attend the conference. It wasn’t the ideal conference experience we had hoped for, mostly because Hillary fell ill just days before it started. Still, we made the most of our time at Open Engagement, meeting other presenters and engaging with artists and collectives who had booths set up in order to share their work. The highlight of Open Engagement for us was participating in a discussion around soil and social practice on the podcast Bad At Sports. You can learn more about Bad At Sports and listen to the episode here. Thank you so much for having us, Open Engagement, and we look forward to seeing what comes next!